Quirepace BVC multistage blowers and vacuum pumps are ideally suited for combining with petrol and diesel engines for applications where no electricity is available. From the small YP3 unit to the large AB08, all BVC multistage blowers and exhausters are available as bare-shaft modules, and we are able to configure all of these to use a power source of your choice. Small petrol engines are available from many manufacturers and depending on the duty cycle and return on investment required we can help you choose the most appropriate engine for your application. Our specialist sales staff can advise on gearing, connection sizes etc. to achieve the desired suction, pressure and flow rate you require. Quirepace can provide basic petrol and blower/pump modules as an OEM unit to be built into your own equipment or can supply complete assemblies ready for use mounted on trolleys or built into frames. 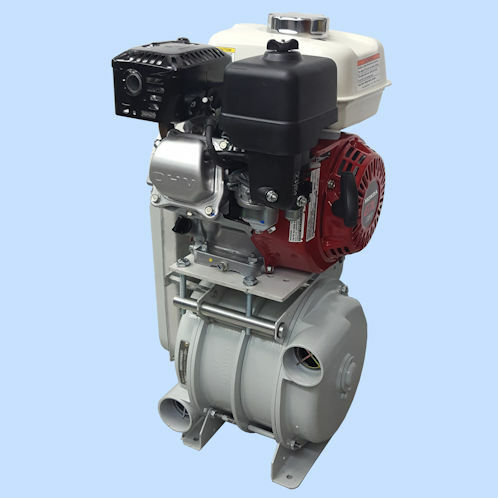 Wherever blown air or air vacuum is required, and no electrical source is conveniently available, the solution may be BVC petrol powered blowers or pumps. Please contact us and talk to our specialists who will be pleased to advise you on the many options available.